It was like parallel universes clicked in place when I discovered that one of my Masters students this semester, Serene Wee, is a published children’s book author. I knew that she looked vaguely familiar when I saw her in class. When she introduced herself and gave her name card, and spoke about the recent AFCC (Asian Festival of Children’s Content this May 6-9, 2010), it dawned on me that I must have seen her at the Arts House during the conference. Thank you so much Serene for agreeing to be our first Featured Storyteller here in Gathering Books. 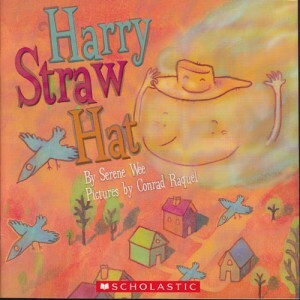 It truly is our pleasure to showcase your lyrical writing (neatly packaged in brightly-colored picture books for children) to more people out there. In addition to being a published picture book writer for children, Serene also happens to be the Chairperson of the National Book Development Council of Singapore since 2007 as well as the President of The Society for Reading & Literacy in Singapore since 2005. 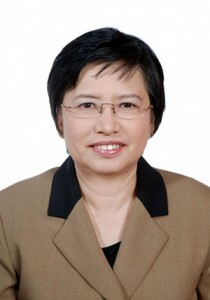 She has personally told me about her passion and enthusiasm in being actively involved in reading programmes in Singapore. From there alone, I deduced that she’s the perfect First Author for our Gathering Books website whose lifeblood is our passion for the written word. to my 8-year old daughter, I can not help but notice how the cadence and the rhythm of the words predominate in the pages. When I read the write-up on Serene, it began to make sense. Apparently she has received the Editor’s Choice Award for Outstanding Achievement in Poetry from the National Library of Poetry in the US. Thus, the words in each page sound truly poetic, rather than something which is written in straight [boring] narrative. 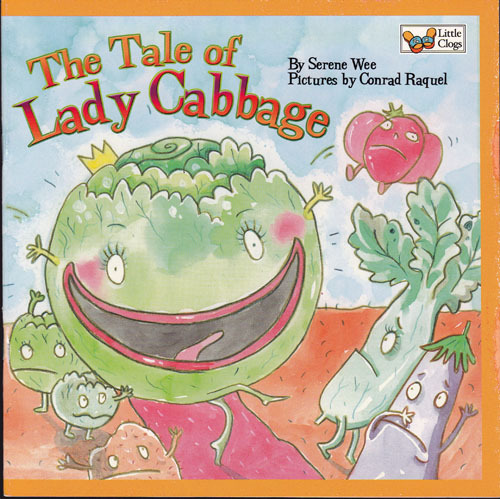 What is even more interesting is the fact that the illustrator for two of her books Harry Straw Hat and Lady Cabbage happens to be a Filipino artist, Conrad Raquel, who graduated from the same university where I came from, University of the Philippines. Serendipity, indeed. How long have you been writing books for children/young adult? Any special reason why you chose this particular genre? I would say that I started writing a long, long time ago and when I started in the 80s. I wrote as and when I get my inspiration -both for children and adult writing. I love writing. When I joined the writing group WordWrights, a Special Interest Group of The Society for Reading and Literacy, that’s when I first started concentrating my efforts on writing for children. I love reading children’s books too, that’s why I decided to switch to writing for children and young adults. I also found it a challenge, as an adult to write for children. I have two adorable god-daughters, both my nieces. One was a toddler and the other about 5 or 6 when I first started writing my picture books. The toddler gave me inspiration while the older one became my ‘critic’ – if my writing bored her, it went out the window. Of course I tested it with other kids too, friends’ children, just to get second, third, fourth opinions. I’ve always loved writing, even as a kid in school. I loved writing compositions and couldn’t wait to get my assignment back from the teacher to see if she liked what I wrote. So I would say, as long as I could remember, I wanted to write. I did not think of writing as a career then, because as a kid, I didn’t think much about what I would do for a living. I knew I would get a job somehow but at the back of my mind, I told myself that whatever job I got, I want to make sure I get a chance to write. Funnily enough, in most of my jobs that I got through the years, whenever there was writing to be done, it would land on my lap. I was made editor of newsletters or magazines, and I wrote marketing spiel and anything to do with creative writing but I stop short of writing speeches or anything heavy going. I much prefer creative writing and giving vent to my imagination. What are some of your favorite books/who are some of your favorite authors in the YA lit/children’s book genre whom you feel may have influenced or inspired you in your writing? One of the earliest books I read which I loved, was Little Women and like most kids in Singapore, during my days, we read Enid Blyton’s books but I would not recommend that today simply because her books, although interesting, do not challenge the reader. When I read The Little Prince and Roald Dahl’s books, that was when I decided, I wanted to write and maybe, be a writer some day. I loved Roald Dahl’s wit and style of writing and I loved books that make you think beyond the story. That was what inspired me to write, that perhaps one day, I would be able to write like him. What constitutes a good children’s/YA story for you? Today I would recommend books that make the reader think, books that show instead of tell and definitely books that are well written. In a good book/story, there must be strong characters or at least characters you can either identify with or empathise with. The plot has got to be good and the style of writing smooth and an easy read, not something that makes you check the dictionary every few minutes. Most of all, the book/story should have a ‘wow’ factor. And when you come to the end of the book, you feel satisfied because you just went through an amazing journey of discovery. I would like to add that I would not recommend reading books that lean heavily on Singlish* to bring out the flavour of Singapore. It is okay when the writer brings in some street language but to do so in a big way, that’s not even ”politically correct”. I respect the reader and leave it to him/her to judge. If you’ve enjoyed reading the book, good for you. Just be aware of the language element. *Singlish is Singapore-English language, what is commonly known as speaking in the vernacular in Singapore. This is very similar to what we call Taglish (Tagalog-English) in the Philippines. What are some of the joys in being a writer? What are some of the difficulties that you have encountered so far in writing? How about in publishing? One of the curious things I found about writing is that sometimes, the story will write itself. It sounds spooky but it’s true and this is one of the joys of writing, to discover that the story has a life of it’s own. And when I finish writing a story, I feel an incredible sense of fulfilment, like I’ve just filled a gap that I knew was there but couldn’t put my finger on it until I finish writing. When a friend sent me an sms and said, ”My girl read the first page and she couldn’t wait to continue reading the book..” - that was reward enough. When another rang me up and said her whole family is trying to get away from their four year old who wouldn’t let them off till they’ve recited When Feet Talk with her and they’ve already done that hundreds of times, that was priceless motivation to write the next book. The four year old knew the book so well, she got annoyed every time they missed a word here and there. I thought it was hilarious. Difficulties – I was so afraid my writing was not good enough when I first decided that it was time to take it out of my folder and present it to the world. I edited it more than 50 times after I have supposedly finished writing it and that was after it had already gone through at least 5 critical reviews with people who are not just experienced but are writers themselves. It is getting past myself that was the hardest part- Do I dare, do I dare to get it out there? That was the question. Then came the hard part – getting a publisher in Singapore. Would you share with us in Gathering Books how your first book got published? What was the feeling like? When I first tried to get it published, before the First Time Writers and Illustrators Initiative was introduced, I tried several publishers. Getting turned down, time and time again wasn’t very good for morale. Finally, I decided to do it myself. If you get turned down like I did before, just do it yourself but make sure you got a good illustrator and editor if you are planning a picture book or definitely a good children’s books editor if yours is a novel. Be willing to pay for top quality editing and if you still find mistakes, get a new one but get it right. You cannot afford to find mistakes in your first book. But I have to admit that I was so inexperienced in publishing I even forgot to put my name on the front cover! That’s why you need a publisher, a good one who will not forget something so important. The feel of your first published book is like holding a new born in your arms. I don’t have children but I know that feeling when I first held my nieces in my arms for the first time. You can’t describe it, you can only feel it. 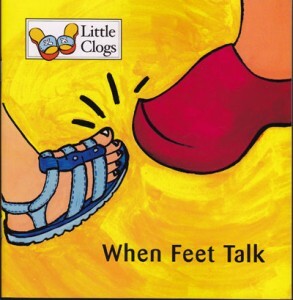 When I first got When Feet Talk from the printer, I couldn’t put it down ‘cos I couldn’t believe I did it. Your latest book which was launched during the Asian Festival for Children’s Content, “Present” is a YA fiction, any special reason why you shifted from picture books to this genre? Yes, it is a story I started writing 7 years ago, first as a short story and after a publisher reviewed it, she said it should be a chapter book/YA novel. I love reading YA books and thought it would be a challenge to write one. Also, I wanted to write this story in memory of a little boy I knew years ago. This is how I imagined he would grow up to be – a sensitive, lovable character like Mat in the story. Are there special issues that you think are being faced currently by writers coming from Asia? What is it like to be a children’s book/YA lit writer in Singapore? The market in Singapore is terribly small and our retailers tend to put mainly best-selling authors in their display spaces, so local authors don’t get enough exposure in the store front. There’s not enough support by local book retailers to publicise and sell local authors. One local book chain even asked for listing fee from new publishers struggling to get into the market. They take money from you first and then put your books on the bottom shelf where it is so obscure, you can’t find the books! This is reality. I’ve gone to the Frankfurt book fair twice and I find that people don’t come looking for books written by Singaporeans because there is no buzz. Singapore is not known for writing. Two years ago, Lat from Malaysia launched his book in Frankfurt and there was a crowd that gathered to listen to him. We need to do that for our writers, good writers in Singapore, not necessarily the best selling but the best written books and not the grant awardees either because those are not necessarily the best written books. We’ve got only one chance so we need to showcase the best of the best, be they adult or children’s books, in an international event to persuade book trade people to take us seriously and give us a shot. If anyone wants to be a full time children/YA book writer in Singapore, be mentally prepared that this is a long, hard road that you’re taking. Don’t expect to be rich and don’t expect to become famous either. Just do it because you have a ‘fire in the belly’ and you write because you want to, passionately and you want to make children happy because you have good stories to tell. Love it, live it, write it. In “Present” you have talked about what has been referred to in Singapore as being a “kiasu” parent – could you share with us the cultural dynamics that led to this kind of mentality? Hm, I guess it has to do with parents wanting the best for their children and at the same time wanting to make sure that they get all the help they need. Keeping up with the ‘Joneses’, not wanting to be left behind because there is an inherent fear of not having enough to go round, has probably contributed to this mentality and I don’t think this is unique to Singapore only. This happens in other places too but perhaps it is more pronounced here because we are such a tiny place. When you believe in abundance, your fear of not having enough dissipates and that’s when you learn to become less ‘kiasu’. 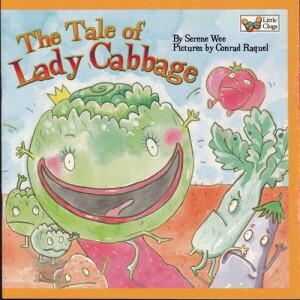 When you showed me the book The Tale of Lady Cabbage, you mentioned that it has a Filipino translation. How did you link up with Filipino publishers? What is the story behind this? Well, it was during the Asian Children’s Writers and Illustrators’ Conference that I met a Filipino publisher who saw my first picture book. She liked it and was keen to publish my next two picture books in her country. That led to a colloboration. I’m happy that my books are selling there because that is the start of cultural exchange. It also goes to show that attending conferences and networking with others do help, if you want to meet the right people to publish your books. What inspires you to write? Any advice for our young writers out there? Quite frankly, I can’t really say if there is any one thing that inspires me. I get an idea some times just by observing people or it could be from something I read or heard about and that little idea or thought germinates in my mind and suddenly, the story comes rushing out and I have to write it down. So if you have an idea in your mind, let it flow and listen carefully to it as it percolates and write it down. Mem Fox said it well when she said, you can’t publish a blank paper. If you want to be a writer, write! The more you write, the better you become. There is no short cut and read as many books as you can get your hands on. If you want to be a writer but you don’t want to read, my advice is, find something else to do. Any future books in the works? Yes, I am actually working on a short story and am re-thinking a series of three books that I wrote long ago but have put aside for various reasons. I need to re-work it so that it can be published. Perhaps I will combine the three and make it into a novel. But right now, I’ve got to get through my Masters programme! I am sure you will just do great in your Masters Programme, Serene. It was truly our pleasure inGathering Books to present some of your writing to the world. Best of luck in your writing and in your studies!